Eat healthy snacks. An apple a day keeps the doctor away. Keeping the office and your body full of healthy foods will not only keep you happier and healthier, you’ll also stay away from the common “hanger,” a term often used to describe someone who is hungry but acts angry. You’ll find mixed nuts, fruit, granola bars and other healthy choices in all of our offices. Stay hydrated. We no doubt fill our bodies with cups and cups of coffee, maybe even Red Bull, not realizing this liquid shot of caffeine does little to maintain proper hydration. Did you know that even mild dehydration can affect mood, energy level and the ability to think clearly? Next time you’re feeling sluggish, reach for a glass of water instead of an energy drink. Staying hydrated throughout the day is key to maintaining a healthy presence. Take breaks. Make a point to get up every hour from your desk. Walk around, grab some water (see number 2), say hi to others in the office, take a stroll around the block and get some fresh air. We’re all about getting work done, but make sure you make a point to get up and stretch your legs throughout the day. Set a timer to remind yourself it’s time to move. Exercise. Beyond getting up a few times throughout the day to stretch your legs, why not take it to the next level and throw in a few jumping jacks or wall sits? 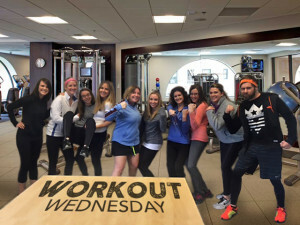 Many Fingerpainters in the Villanova office have adopted #WorkoutWednesday. Try doing a 1-minute plank or a wall sit every day for a month. Wear a Fitbit? Great! Find others who sport the health fashion and keep each other accountable. Set daily and weekly goals for yourselves. Inspire a healthy competition by putting a little money or prize on the line—you’ll be surprised how many more people want to take a walk with you. Work from home. Who says you need to be in the office to produce great work? Sometimes, a change of scenery is all you need to get back in the groove. Check with your boss about your work-from-home policy. It’s guaranteed that he/she would want you at your best. If working from home isn’t the best option, try setting up your work station in your office’s common area or down the street at a coffee shop. You’d be surprised how a little chaos can keep you even more focused. Celebrate your accomplishments. Client deadlines, long nights, crazy revisions. Make sure they don’t go unnoticed. In addition to helping the team complete projects, make sure their hard work is celebrated at the end. Everyone loves a pat on the back (and a beer, too). Send out thank-you emails to team members who have helped you. Or buy their coffee the next time you’re making a caffeine run. Little acts of kindness go a long way. You’d like it if someone did it for you, right? 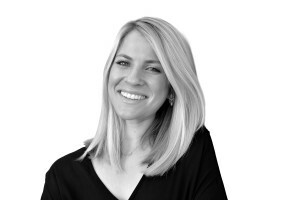 Toni Teplitsky brings her left and right brain to work for the Strategy team in our Scottsdale office. Combining creativity and analytics in the world of social media and digital communications. When she isn’t Instagramming, tweeting or snapping, she is on her yoga mat finding a little Zen.